Inflatable chamber to provide temporary additional space for cramped space craft. Space travel in Niven's Known Space stories is best accomplished with one of the General Products hulls; however, space inside was typically very limited. Additional space for exercise or living was available in the form of inflatable expansion bubbles. This item comes from the story Flatlander, published in 1967. We were in the expansion bubble when it happened. The bubble had inflatable seats and an inflatable table and was there for exercise and killing time but it also provided a fine view; the surface was perfectly transparent. The bubble itself could be unfolded without air pressure using an electromagnetic field (normally used to collapse the bubble after use). 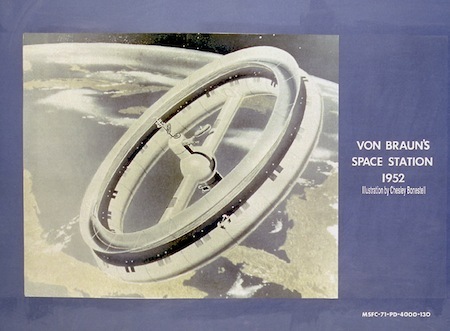 In a 1952 series of articles written in Collier's, Dr. Wernher von Braun, then Technical Director of the Army Ordnance Guided Missiles Development Group at Redstone Arsenal, wrote of a large wheel-like space station in a 1,075-mile orbit. This station, made of flexible nylon, would be carried into space by a fully reusable three-stage launch vehicle. Once in space, the station's collapsible nylon body would be inflated much like an automobile tire. Compare to the space bubble from The Planet Strappers by Raymond Z. Gallun and to the Survival Bubble (Beach Ball) from Footfall (1985) by Larry Niven (w/J. Pournelle).